Senator Elizabeth Warren is hoping to be the Democratic presidential nominee in 2020; she distinguishes herself from other left-wing Democrats like Bernie Sanders in her belief that capitalism is a force for good, but must be reformed and subjected to democratic control, while Sanders and the DSA are skeptical of capitalism and its long-term future (Disclosure: I donated to both the Sanders and Warren 2020 campaigns). Warren's defense of a better capitalism distinguishes itself from the usual fare -- capitalism's apologists rarely have much detail to offer in terms of what a "good capitalism" would look like -- by setting out specific, actionable policies, often in the form of detailed legislative action, for a reforming capitalism and rendering it safe for human habitation. Whether that's ending the Electoral College, state-backed generic drug manufacturing, or a Thomas Piketty-style wealth tax, Warren sets out an extremely plausible case for a humane version of American capitalism. One of Warren's most welcome proposals is an antimonopolistic break-up of Big Tech, which, while laudable, did not go far enough -- for one thing, it was conspicuously silent on the question of breaking up related monopolies like Big Cable and Big Content, and it also spared one of tech's most voracious and abusive monopolists: Apple. 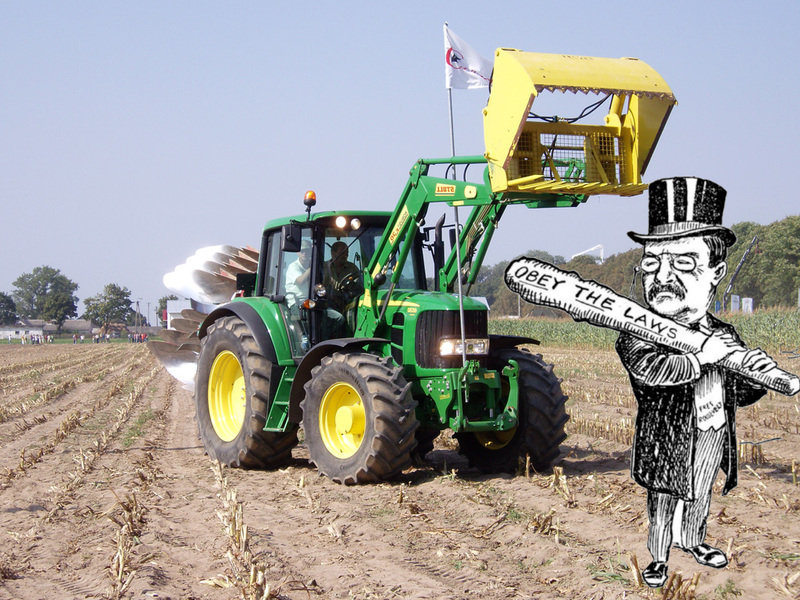 Now, Warren has introduced another flagship proposal that has spared Apple while putting other abusive manufacturers square in its crosshairs: a national Right-to-Repair law as part of a family farmer's bill of rights. Warren's Right-to-Repair rules tick all the boxes in the blizzard of state-level Right to Repair bills that have been introduced and largely defeated, thanks to an alliance of big agribusiness companies like John Deere and consumer electronics companies led by Apple. But Warren's Right-to-Repair bill limits itself to agribusiness; "requir[ing] manufacturers of farm equipment to make diagnostic tools, manuals, and other repair-related resources available to any individual or business, not just their own dealerships and authorized agents." As mentioned, the Warren proposal is embedded in a farm-oriented proposal that also includes many excellent measures like breakups of agribusiness monopolies like Monsano/Bayer and Dupont/Dow, a ban on vertical mergers, an end to the use of federally administered (and funded) "checkoff programs" to attack family farms and benefit big players, an end to abusive contract farming arrangements common in the heavily monopolized poultry industry, strict country-of-origin rules for beef and pork, and a ban on foreign acquisitions of US agribusiness and farmland. All that adds up to an amazing and important policy platform, and one that is extremely tactically sound, aimed squarely at the myth that the Democrats are the party of urbanized people on the coast while the GOP looks out for the interests of forgotten, rural places (nothing could be further from the truth). It will also rob the opposition to state right-to-repair laws of a key partner: without agribusiness on its side, Apple will have a much harder time scuttling state efforts. It's also bound to be extremely popular, as are the other Warren campaign planks. Warren is proving to be a master of identifying the issues with overwhelming bipartisan popular support that the GOP establishment refuses to consider. That said, I'd love to see her pull all this together with an overarching policy that says, "No company should be able to decide who is allowed to compete with it. No company should be allowed to prevent independent repair, or force customers to buy consumables or software from a company-run store. No company should be allowed to withhold its service materials, or block the production of third-party parts." And while we're at it, "No industry should be as concentrated as American industries are today, and every kind of monopolist in every industry -- telcoms, agribusiness, tech, media, etc -- will be forced to divest or break up on my watch.